The majority of the commands should be pretty straight-forward but there are a couple I would like to call out that I'm very excited about. The first is the ability to easily update any field from the current record you're on. This is extremely helpful when you have a field that doesn't exist on the form but you need to modify it for troubleshooting or testing. All you need to do is execute the "update [attribute schema] to [value]" command. As an example, if I'm on an Account form, I can execute "update telephone1 to 1234567890" and it will update the telephone1 attribute to 1234567890. The one downside to this command (again due to API limitations) is you need to be on the Unified Interface version of the form. The next command that I love is natural language querying. 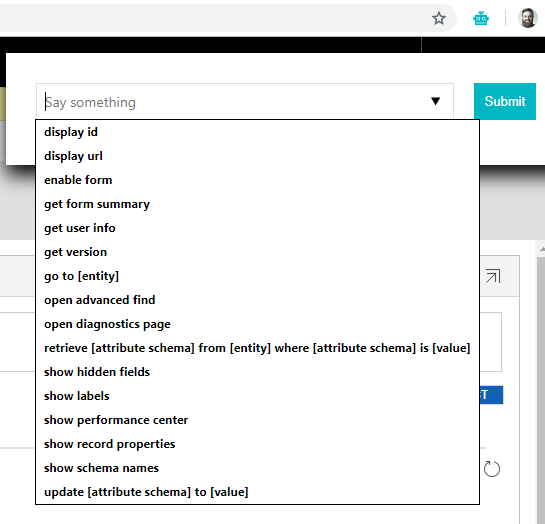 Execute the "retrieve [attribute schema] from [entity] where [attribute schema] is [value]" command and the Toolbot will display the values from the attributes you specified based on your filter. 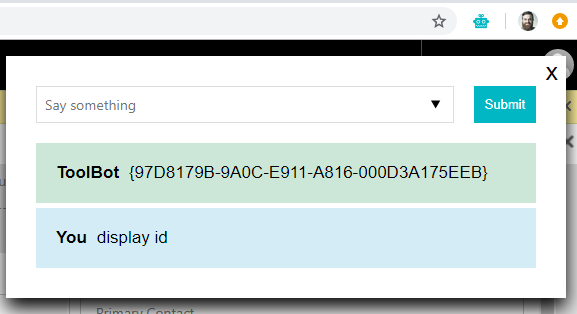 For example, I can execute "retrieve telephone1 from account where name is test" and the Toolbot will display the telephone1 attribute from the Account named test. You can specify multiple comma delimited attributes as well. Although this command is very basic, the plan is to expand on it further in the near future to allow more filtering conditions. So there you have it! I hope you enjoy this new tool and find it useful. I will be enhancing it with more commands in the near future. Feel free to reach out with any feedback or suggestions that you may have.